A sunroom can be the most versatile room in your home, though it’s most often used as a second living room. However, you can use it for anything – from a quiet, relaxing spot to enjoy your morning coffee to an entertaining room fit for a family reunion. Whatever you use your sunroom for, here’s a list of the seven things you need to make it perfect. Seating is probably the most important item on this list, as well as the one item you should splurge on if you have the means to do so. The majority of people use sunrooms as a second living room, a gathering room, or a room to relax in. This means that most of the time, people will be sitting in your sunroom. Consider getting full sofas or daybeds in fun patterns for a comfortable, casual vibe. Use sleek, solid-colored chairs and sofa for a more modern design. 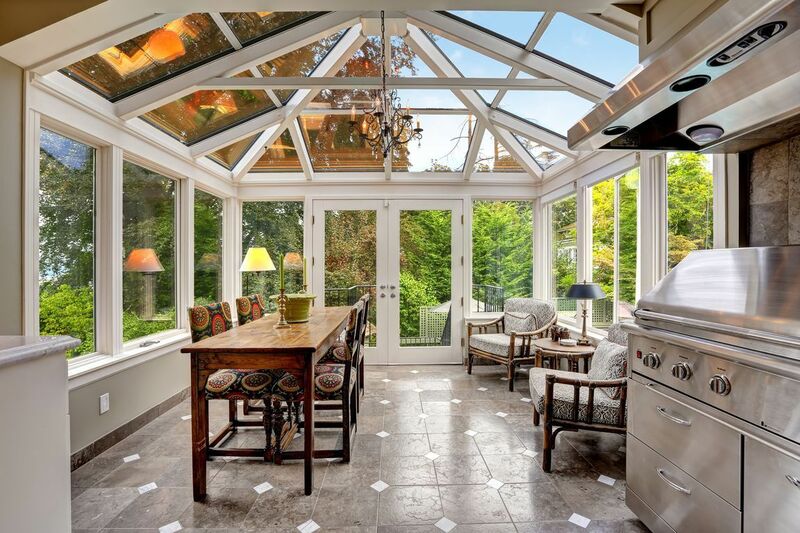 Most sunrooms aren’t built with central heat or air, so it’s important to find ways to keep yourself cool in the summer and warm in the winter. Take advantage of ceiling fans for those hot, sunny summer days. If you think you’re going to be spending a lot of nights in your sunroom, you may want to think about installing a fireplace to keep you warm and toasty on cold, winter nights. Since sunrooms are built to let in as much sunlight as possible, they are usually built with floor-to-ceiling windows. Huge windows let you see the beauty of nature in your backyard, but it also lets your neighbors see into your sunroom. If you have nosy neighbors or simply want to anyone peeking in at night or while you’re away on vacation, privacy shades are a must-have. As an alternative, you can also get your windows tinted so you can see out but no one can see in. 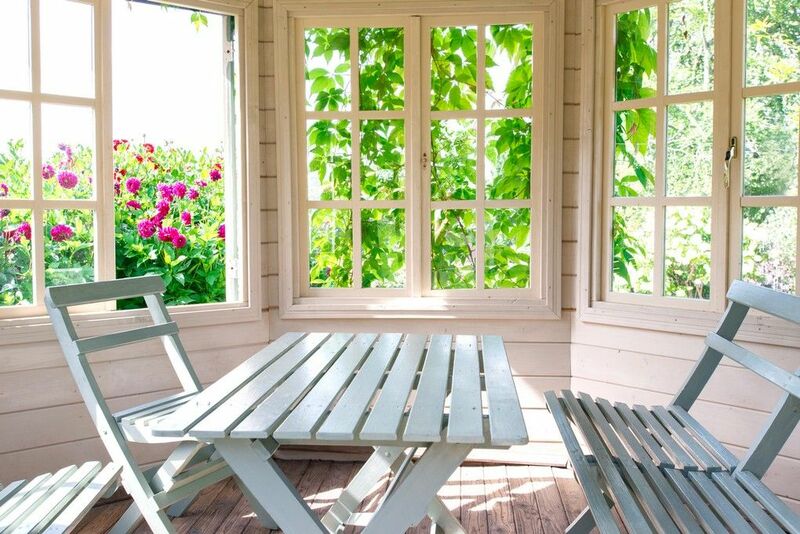 If your sunroom is in the rear of your house and looks out into your backyard, consider bringing some of your backyard inside to create a smooth and natural transition from indoors to outdoors. Putting potted or hanging plants in your sunroom not only boosts your decor, but it also creates the illusion that you’re sitting outside without being bothered by pesky bugs and mosquitoes. Besides being a second living room or gathering room, you can use your sunroom as a home office or studio. To do this, you’ll have to either have a strong wifi signal that reaches your sunroom or you can have an ethernet plug installed. You can also get a phone line and electrical outlets so you can take business calls or work on that powerpoint slideshow while watching the hummingbirds hover in front of your windows. If the main objective of your sunroom is to entertain guests, make sure you have something with which to entertain them. A small TV or stereo can go a long way towards making your guests feel welcome and keep them entertained while you prepare dinner in the kitchen. If you want to keep your sunroom free of electronics, consider putting a stack of magazines on an end table or installing a few shelves to house some inviting books. Crossword puzzles and sudoku puzzles are also a great idea – just make sure you have pens or pencils handy. A sunroom is the perfect room for all of the whimsical, thrifty, and unique items you’ve picked up over the years that don’t seem to fit in with the styles of your other rooms. An oversized clock or mirror would make a great conversation starter. A unique lamp from the thrift shop down the road could look perfect on the wicker end table you have. Your sunroom can be as eclectic or simple as you want it to be. In the end, it’s your sunroom and you should feel free to decorate it with items that bring you happiness and comfort. Written by Kelly Mahan, also writer for Interias, a company that helps homeowners find the best contractors for their home improvement projects, right in their area.